Having the characteristics of a leader and being in the position are two different things. Have you experienced team leads who were less than great, or worse, downright toxic? On the other hand, people with leadership qualities make you feel special just to be invited along for the ride. They convince the team that together, anything is possible. People with strong leadership attributes use a specific set of skills. It looks like charisma, but it’s not. The good news is that leadership skills can be learned, practiced, and mastered. In my work with clients, I’ve seen it happen. Courage does not mean that you never feel afraid. It means acting in the face of fear. Fear of conflict: Telling people things they don’t want to hear. Fear of vulnerability: Taking ownership of mistakes. Fear of failure: Making a decision when you can’t be sure of the outcome. There’s a reason courage is at the top of this list. It’s the foundation of many other leadership attributes. For example, you can’t be a good communicator if you avoid conflict like the plague. Ethical leadership is more than avoiding corporate crime (or avoiding getting caught). It’s also treating people fairly, and creating an environment that encourages team members to do the right thing. But how can you do that when ethics vary between individuals? As a leader, it’s your job to establish organizational values and model them. For example, a code of ethics establishes the priority of values like inclusivity and respect. Sometimes doing the right thing for one person means offending another. Competing values create ethical dilemmas — you have to make the call. The best approach is to genuinely care about everyone’s best interest. When you can’t give everyone what they want, you can make sure everyone feels respected and understood. Leading when your seas are smooth is easy. A true test of leadership comes in times of crisis. Resilience is a leadership quality that enables you to bounce back when things fall apart. If your response to a crisis is, well, falling apart, your employees will too. They may even start updating their resumes. It’s important to stand strong during troubled times. Showing professionalism and confidence helps your team stand strong with you. That’s not to say expressing emotions is weak. In fact, it makes you more human and a better leader. But you must always focus on recovering from setbacks, not wallowing in despair. Arrogant leaders make excuses, blame others, or even lie to save face. This behavior not only erodes trust, but it kills creativity. Humbly admitting when you are wrong shows strength in leadership. In fact, it’s what makes a great leader. Owning your mistakes models for employees how to act when they screw up. You can also practice humility by appreciating that you don’t shoulder all of the work for your company. You are the rudder that guides your crew to be their best selves. If you want to display exceptional leadership, pay attention to your team’s talent. Share the successes your company achieves with others who have contributed, and encourage collaboration and growth. Your business moves forward as you include your team in important decisions and remain grateful for their input. As a coach, I may be biased, but there’s a good reason the top business leaders use executive coaches. Great leaders have to know how to coach — and how to be coached. Self-evaluate: Take stock of your strengths and weaknesses as a leader. Seek feedback: Ask your team how you are doing and what you can do better. Take action: Work to improve weak areas, and try new approaches. A solid team works best with a leader who is open to changing their attitude and behavior. If a leader isn’t coachable and lets their ego dominate the conversation, team members won’t be inspired to give their best. Waiting too long to act can cause your business to stagnate. Waiting for the right moment is something else entirely. This is the kind of patience you need. Patience comes from your ability to endure short term challenges for greater long term gains. Leadership requires that you calmly evaluate problems, and locate the source of dysfunction. Of course, even the most level-headed leaders feel angry and impatient sometimes. But they take the time to calm down before they act. Losing patience leads to poor thinking and rash decisions. Without patience, you might scrap projects prematurely, or give up on employees with great potential. Your team will have greater faith in you as you avoid reckless decisions that take your company’s goals off track. Analyze: Avoid using emotional reactions to guide your decisions. Look at problems from as many angles as possible. Collaborate: Involve your team by communicating issues and asking for input. Balance risk: Every solution will have risks and benefits. Look for the best payoff with an acceptable level of risk. Each time something unexpected happens, it’s a valuable opportunity to learn how to better respond in the future. As a leader, you need to be internally motivated to achieve your personal goals as well as the goals laid out for your business. Having strong internal motivation will push you to work hard and move forward. This attitude will inspire your team as well. They’ll be more likely to work harder along with you. Motivation isn’t something you wake up with every day, and some days you might not feel motivated at all. Fortunately, motivation can be turned into a habit instead of a mood. If you’re not feeling motivated, get up, show up, and do the work anyway. Soon enough you’ll build the momentum you need, and progress will happen faster than you can imagine. Studies have shown that dishonesty causes enough stress in the brain and body to negatively impact performance. Even when things aren’t going too well, it’s necessary to be honest with your team. Transparency is an important aspect of building trust in those you want to lead. Be clear about your expectations so your team members know what to aim for. It’s difficult to be honest and direct when giving critical feedback. That’s no reason to avoid asking for better work — practice combining compassion with honesty to get better results. Remarkable leaders are brutally honest with themselves. It’s the only way to grow and improve. Not surprisingly, honesty also plays an essential part in learning how to be a badass. Challenges are not going to stop appearing, no matter how successful you become. Employees can give up and look for another job when things get difficult. Leaders can’t. As a leader, you keep working through the tough spots. You steel your resolve and inspire your team to keep going when they get discouraged. Another word for this is grit — the combination of perseverance and passion behind every great achievement. Creative thinking leads to innovative ideas that can change the world. It’s also required to solve problems and improve operations. In the daily grind of running a business, there are constant distractions and demands on your attention. Stress and deadlines, although sometimes unavoidable, destroy creative thinking. That’s why it’s essential for leaders to take time out for deep work. You can improve creativity in yourself and your organization by making time for it. Being confident in your decisions is a critical leadership attribute. Without it, you can’t expect buy-in from your team. We’ve already covered being wrong — it’s bound to happen. You can’t always be certain of the outcome. But despite uncertainty, leaders make decisions and move forward confidently. So, even when you’re questioning yourself, act with confidence. It’s been proven that teams are most effective when there’s trust. When people feel threatened, they are afraid to make mistakes, share opinions, and act on innovative ideas. The effects on performance are immediate — and negative. Leaders who create a sense of safety and belonging are neutral when they approach criticism and conflict. Instead of using blame and humiliation, collaborate and problem-solve. Work with their team to find solutions when something goes wrong. What makes a good leader? Excellent communication skills. This is a huge topic because there are many channels and contexts for communication. That means there are many opportunities to get it wrong — or get it right. Consistency: Be clear and consistent in communicating expectations and providing guidance. Listening: Give your team the attention they deserve by actively listening. Safety: When you must initiate a difficult conversation, use non-judgemental language. Don’t attack — state your observations, needs, and requests. Remember that you’re not a boss, you’re a leader, and you are all in business together. Your ego has no place in your communication style so keep an empathetic tone. Speak with everyone’s best interest in mind, be genuine, and be open to conversation. One of the qualities of a good leader is pragmatism — but that can easily turn into pessimism. Instead, focus on cultivating positivity, to bring out the best in your team. Keeping a positive outlook doesn’t mean that you have to be happy and smiling all the time. Instead, a great leader acts from the core belief that the business benefits people and will lead to success for the team. To become a more positive leader, always look for possibilities. For example, when you’re certain something can’t be done, you won’t inspire anyone to try. When you shoot down ideas without actively looking for potential, you destroy creativity. Here is where the inner vision of an exceptional leader takes center stage. This vision is a big difference between someone who is a boss or manager and someone who is a true leader. Remarkable leadership is a by-product of learning how to find your purpose in life. A leader acts with a purpose, a dream that the world can be a better place. They seek to solve problems and help people improve their lives. A purposeful leader isn’t interested in business for the sake of business. They see profit as simply a side effect of creating profound beneficial change in the lives of others. Those on the team of a purposeful leader work each day with a dream of a better world in their hearts. Maintaining a growth mindset is one of the fundamental traits of a good leader. Instead of being stuck with an existing set of skills, great leaders believe growth is always possible. With this mindset, they have an intense desire to learn. They embrace effort and pursue mastery. Modeling a growth mindset also encourages your team to work through challenges, learn, and grow. In sports, someone who is agile can move quickly, with precision and flexibility. In leadership, it’s exactly the same. Great leaders have their fingers to the pulse of their market and can direct their team to change course as needed. This could mean changing product specifications based on customer needs. It could mean moving timelines because of a changing market. The environment of business is constantly changing. Being able to make these pivots in business can make or break a company. The ruthless, domineering leader is becoming a thing of the past. Leading with empathy gets much better results – to do this, emotional intelligence is essential. EQ is hard to define, but generally, it means awareness of emotions in yourself and others. How good you are at regulating and managing emotions is a measure of EQ. If you have good leadership skills, you read emotional cues and respond appropriately. That said, EQ can only take you so far — you can understand emotions but still lack compassion. True leaders show how much they care. That’s how they win the love and devotion of their followers. Great leaders exude confidence. They are self-assured and have a charisma that’s born from trusting themselves. The confidence of a great leader radiates from them as calmness, sureness, and a sense that success is inevitable. Confidence makes a leader easier to trust and helps to strengthen the bonds of the team. Here’s how to focus and find success. A confident mindset comes easier to some than others, but it’s an essential trait of a good leader. Confidence comes as you live according to your values. It helps you to practice courage and honesty. A great leader is willing to accept responsibility for their words and actions. Not every decision will be a smashing success. When you make a bad call, whether large or small, you have to be willing to admit your errors. One of the characteristics of a good leader is also taking responsibility for the actions of your team. It’s not always your fault, but it is always the leader’s responsibility to find a solution. If blame needs to be discussed, do it privately with only the team members who need that discussion. The art and science of getting results from your team can be learned — and improved with practice. 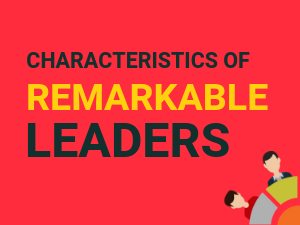 If there are more than a few leadership characteristics on this list that you need to work on, don’t worry. Focus on improving one skill at a time. Before you know it, you’ll be leading your team to the kind of success you’ve only imagined.